Laughter kills fear, and without fear there can be no faith because without fear of the Devil, there is no more need of God. Nearly there. I have since added ammo holders and am contemplating purity seal treatment. Note the basing, how it’s designed to tie the models together and how I plan on expanding the retinue after the invitational. It’s been a welcome brake – but I now miss my Wolves dearly. 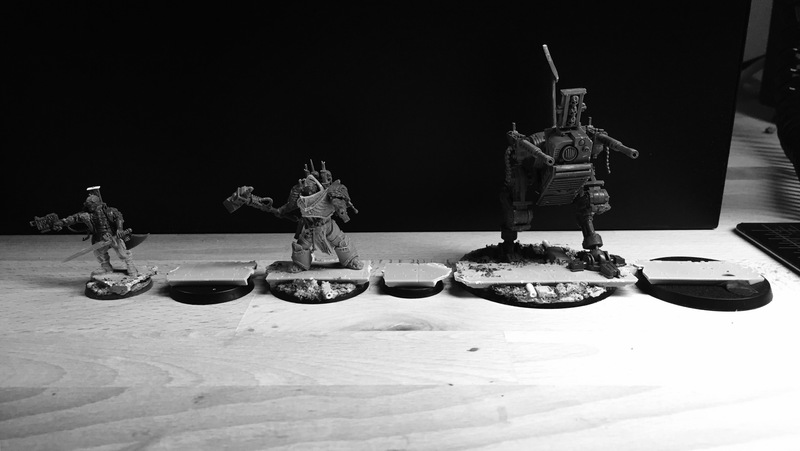 It is very hard to do your best work on two polar opposite themes at the same time, so I’ve held back from the wolves, but now that I am ready for paint, I will get back to realizing the Wyrd of Fenrys. I’m quite pleased with the trio. It’s so important to get the heart of the Retinue correct. 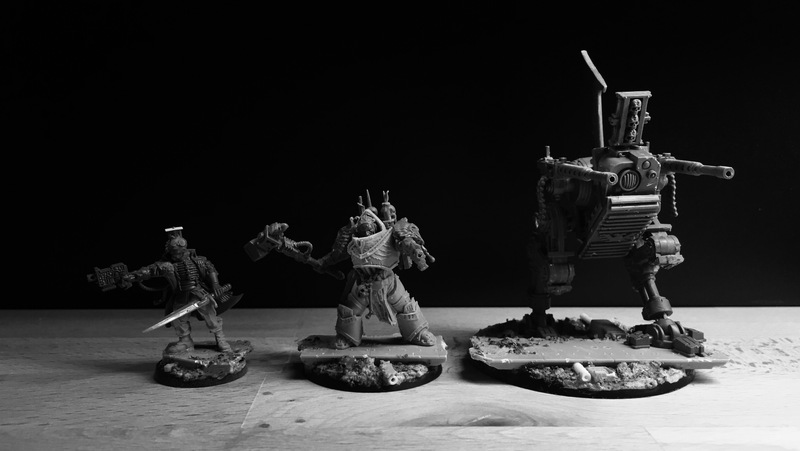 Lord Inquisitor, Interrogator and the Sentinel… with much more gothic things to follow. It is very exciting to see complete pictures of the models! The sentinel is awesome, and a huge departure from the conventional model. Despite being a combination of a bunch of kits, it does not look like that. Is it the idea that they are going up against a horde of enemies, such that they are all facing different directions? Also, I don’t think it looks like the Inquisitor’s head is seated back far enough. I would be inclined to do some more cutting to try to get it to fit in the armour better. Thanks. I wish I could some how reproduce the sentinel design. Would be so cool for a guard army I want to build with the Solar Auxilia. The idea is to have them create a very action packed, middle of a fight scene. I’ve had many active poses in the previous trilogy parts, but now I really want to convey a full frontal Inquisitorial onslaught, guns and the warp blazing. It’s further back than the original head and I love the original model. I think its down to the camera angle and the right arm swinging back with the hammer and the left pointing forward with the pistol – the head is then quite naturally “forward” of the shoulder. I think that you have captured the notion of the characters being engrossed in a tumultuous battle. I guess it may be the angles that I am viewing the model from, but I still feel that the head should be tilted back slightly, and turned a little to be looking more down the sights of his pistol. Though, you have the model in hand and could assess it better than I. Excellent choice for a head, by the way. You could not have come up with something better. On his left shoulderpad, there is a little blood drop charm, or something of the sort, hanging from it. I would be inclined to remove that, as I don’t think it quite fits with the motion of the model. That is very small detail though. Is there any direct Inquisitor iconography on the model? To distinguish him from a really awesome Grey Knight, etc? Don’t let all of my small concerns make it appear that I dislike the models. They are fantastic. A really evocative collection of characters. I absolutely get your stance on the head. I hope to have better angles with a different lense for the final images. He has a bunch of -I- symbols and more to be painted in 🙂 he will also be so painfully golden that I hope no grey knight associations remain. Going to swap the droplet. Was careful to file away all the other BA iconography. Very nice. That last pic with the three together…they just feel right. Cohesive. Complementary. Excellent choice of parts. Very promising looking fellows indeed! Can’t wait to see them completed. 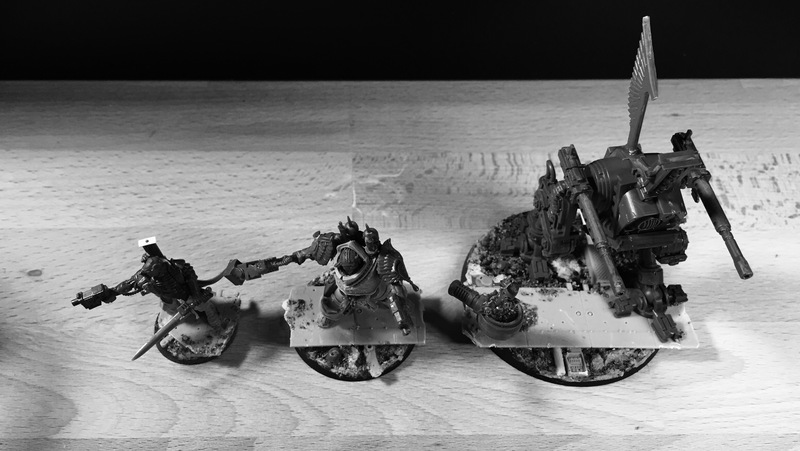 These are some of the coolest inq28 models I have seen in a long time. They are very eclectic, but in a surprisingly cohesive way. I think the walker is the star of the show, looking completely unique despite coming from some very common kits. I love the candles on the inquisitor. They are a small element that seems so 40k, yet they are almost never seen. That FW terminator is a really cool model; the baroque bulky armour is fantastic, and actually makes his bolt pistol seem small! I think you are right that the head angle looks better from certain angles (from the top it looks good). I like the tilt to the head, as it emphasizes his aiming of his pistol. I think I might still tilt it back slightly, maintaining the “down-the-sights” look however. If it were leaned back just a tiny bit, it would look more natural and not as though his neck is stretched. The interrogator is pretty rad too. I really like his simple angular power saber. His face is also a strong point, stoic and full of grit, with some painful looking bionics. His pose is very dynamic, with him leaning in for a shot. I think he might be leaning a little too much however, a quality that is accentuated by his outstretched arm. By adjusting his torso a little, I think you can maintain the strong sense of action, and lessen the sense that he might topple over. Regardless, these excellent entries into the Invitational, made even better by the coherent bases, that put them into a confrontation together. Thanks again for thorough reply and acute commentary. I uploaded an additional photo of the interrogator realizing that because of the iPhone lense he did look like he is leaning over too much, despite in reality having his head aligned with the foot that he has his weight on. Thanks for the additional photo. I was really intrigued to see more of the interrogator. I really like the conversion. The bolter will look amazing in gold. The bases tie really well the group. Very inspiring ! That’s smells like full of promises….. Fantastic work as always Migs! I am really impressed how they all work together and feel connected. My favorite is certainly the Interrogator. I am really glad you replaced his legs with those from the Elysian guardsman. 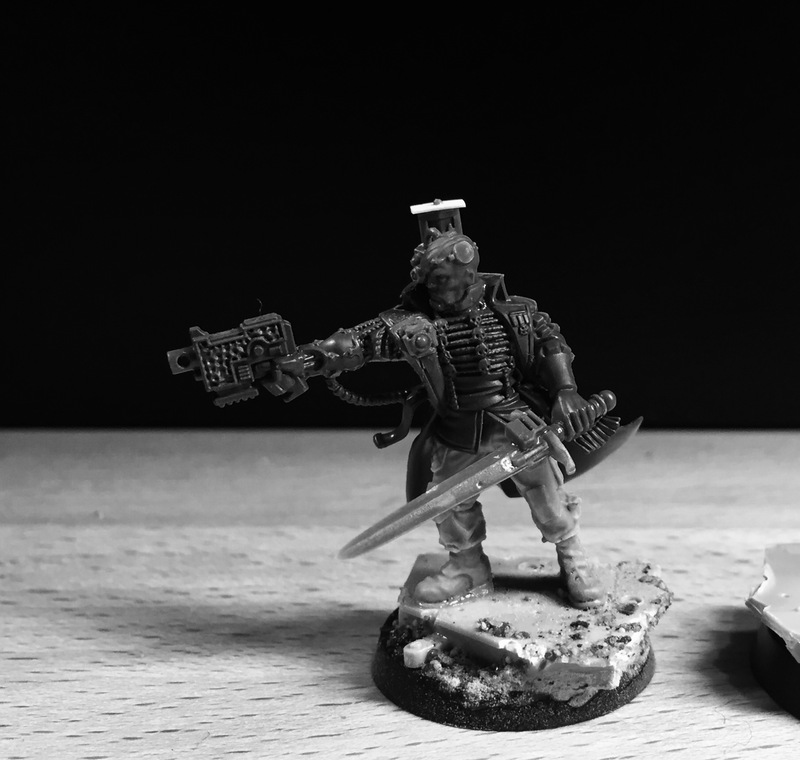 They have a really cool military vibe to them (and are scaled a lot better than most of GWs models, helping to add contrast to your Inquisitor). His power blade is really nice too, the plain double-edged blade speaks towards the Interrogator’s no nonsense attitude and sensibility! My favorite aspect of the model though is his head. I can’t get over how cool it is. Where did you get it from? It sort of looks like one of the Chaos Marauder heads from the Warhammer range (heavily converted with bionics). Thanks. Head is from the Space Marine flyer transport servitor gunner. Modified. Been saving it for something special. They look fantastic Migs. Can´t wait to see the painted!